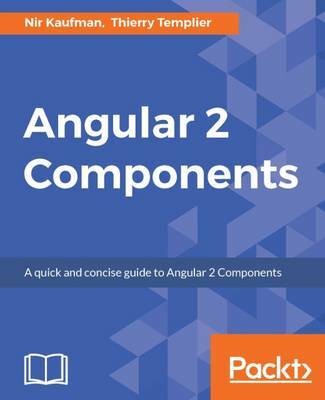 A quick and concise guide to Angular 2 Components About This Book * First look to the Angular 2 Components architecture * Creating your own Angular 2 Component * Integrating your components with third party components Who This Book Is For If you are a front-end developer with some experience in Angular and want to understand Angular 2 Components, and easily put it to use to create powerful user interfaces and views, then this book is for you What You Will Learn * Break your application into reusable dynamic components * Take advantage of TypeScript in Angular 2 * Migrate your Angular 1 directive to an Angular 2 Component * Understand the Angular 2 component structure and APIs * Hook to component life cycle events * Bind dynamic data to your component properties * Communicate with other components using events * Compose complicated UIs from simple components In Detail This book is a concise guide to Angular 2 Components and is based on the stable version of Angular 2. You will start with learning about the Angular 2 Components architecture and how components differ from Angular directives in Angular 1. You will then move on to quickly set up an Angular 2 development environment and grasp the basics of TypeScript. With this strong foundation in place, you will start building components. The book will teach you, with an example, how to define component behavior, create component templates, and use the controller of your component. You will also learn how to make your components communicate with each other. Once you have built a component, you will learn how to extend it by integrating third-party components with it. By the end of the book, you will be confident with building and using components for your applications. Style and approach A step-by-step guide covering features and working of Angular 2 Components along with the process for creating your own components.